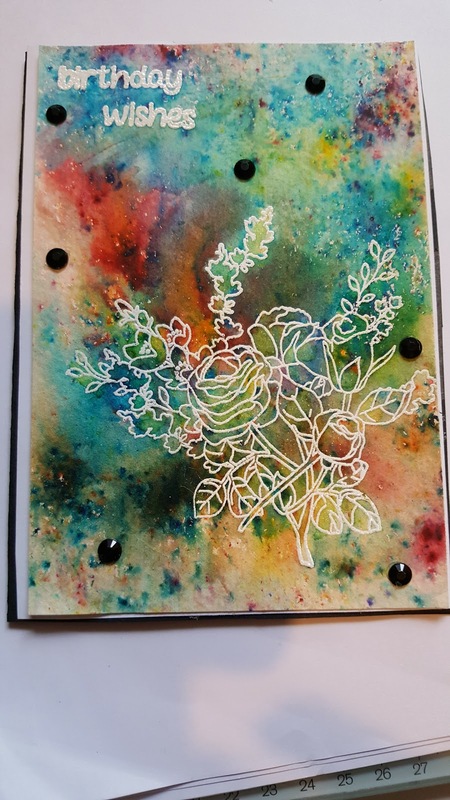 This background on this card was made using brusho's. Firstly I embossed my floral image and sentiment using versamark Ink, I then heat embossed it using Hero arts white embossing powder. 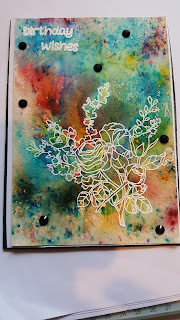 I then used the Brusho's The colours I used were Emerald Green, Scarlet, yellow, Turquoise and purple, I spritzed the brusho's with water and used paper towel to blot over the brusho's. I then used my heat tool to dry the background. I then matted the card onto white cardstock and then on to a black card. I used small black rhinestones for embellishements and finally went over the embossed floral image with my clear wink of Stella pen.